We’ll take you through each of the steps necessary to create your own container garden (and what we do to prepare materials for the “dish garden kits” we offer for sale). What better place to collect natural materials than in nature? We’re lucky enough to live in the “country”. So lucky, that we have our own woods, ravine, and creek. This means that good material is only a short walk from the back door. Wherever there’s lots of trees, there’s bound to be some old or dead wood. 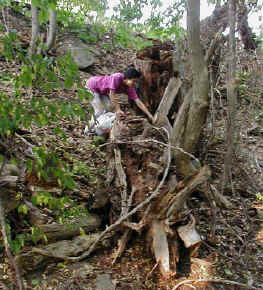 In fact, the old, weathered, sometimes half-rotted wood is the best, since it adds “character” to the planting. We’ve even found that the bark off of very old trees (like cottonwood) is very useful. If you are lucky enough to live near a lake or seashore, look for driftwood, which is what we did on a drive along the California coast. If you’re one of those less fortunate “city dwellers”, you’ll have to take up hiking. Keep your eyes open–a friend of ours is known to frequently stop when he sees something interesting along the roadside (something we’re also often guilty of). 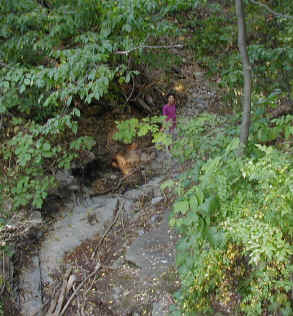 Here, Olive is seen walking in our now-dry creek bed at the bottom of the ravine (it’s been a very dry summer). This is where lots of nice rocks can be found, as well as some old wood. In the spring, standing here isn’t possible–she’d be washed away in a torrential flow of water. When looking for rocks, it isn’t always necessary to find the large ones with pre-existing holes or pockets for planting (though “lava rock” is great for this use). Even a flat rock can be used for plantings–we’ll show you how to plant onto a flat surface later. The rock found in our area is primarily limestone shale–on occasion you can even find a fossil imprint on one. These can be useful either as accents or as the container itself. Look also for rocks with moss or lichens already growing on them–these are the best, since some of the planting is already done for you! They also make your planting that much more interesting and natural looking. Bringing materials inside means possibly bringing in unwanted guests (like pests) with them. Sometimes pests that are relatively harmless outdoors can be devastating to and indoor garden. A tree doesn’t mind sharing with a few little friends, but your houseplants might feel differently. This means that all of the material that you’ve collected must be cleaned and sterilized as much as possible. Note: When ordering our “dish garden kits” this is how we prepare the wood and moss included in your kit. Submerge your material (wood is shown here), in very hot water for at least 20-30 minutes. This water should contain about 10% bleach. This will kill any little critters that may be hiding in the wood, (others will float to the water surface, which you can then pour off) and also keep the wood from rotting any further. How long you choose to soak the wood depends partly upon how you want the wood to look afterwards. The longer it is soaked in the bleach solution, the lighter will be the color of the wood. Soaking longer also makes the rotted surface or portions of the wood more likely to be scrubbed away when cleaned. For this reason, bark, or very old, rotted wood, probably shouldn’t be soaked for too long a time. If you have a piece that you’d like to show in more detail, without the distraction of the bark say, soak it longer and scrub away as much material as possible. This will show its smooth surface and all of the interesting details that can be seen there. Driftwood can be treated this way. 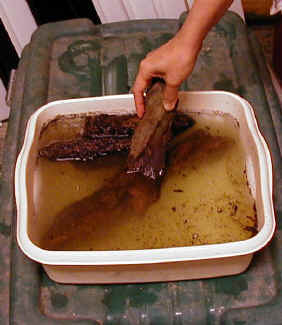 After soaking the wood, scrub away the very soft material–it will have almost a “mud like” feel. Rinse away any plant material hidden within the wood. Be sure to rinse away any critters or larvae that you might discover. Some of the most interesting pieces need the most cleaning. A small scrub brush works well. For small pieces, or getting into small crevices, a toothbrush works even better. If you have really good water pressure (we don’t) you can use a garden hose sprayer to clean pieces with a strong blast of water. If you find that you’ve “over cleaned” a piece, so that it’s lost its old, “rotted” appearance, don’t worry. The wood that we collect will eventually begin to decay when planted in our container anyways–it’s a natural process (driftwood, of course will last a lot longer). We often reuse pieces in plantings–each time it giving a different appearance as it ages. Eventually the piece will just “fall apart” from old age. The native mosses that we collect on our property are another very useful material for container gardens. They come in a variety of textures and colors, from yellowish-green to deep green, to silver or brown. The best mosses are those that can be easily removed from the ground–that can be “peeled” from the surface like a blanket with very little soil attached. 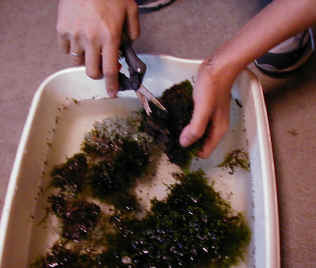 To prepare the mosses, first let them soak in room-temperature, plain, water. Change the water, pouring off any little critters (moss usually has relatively few of these) and debris. Pick through the moss and remove debris by hand if necessary. Old, dry, moss can often be made lush and green again with a good soaking, too. If your moss has excess roots or soil attached to it, trim away this with scissors. Mosses are very shallow rooted–they don’t need all of the extra soil anyways. Give the clump of moss a good squeeze (like a sponge) to get rid of the extra water.